The Darkness Visible comic book series by Mike Carey and Arvind Ethan David is getting the TV series treatment from IDW Entertainment. According to a report from Deadline, IDW will be developing, financing and producing the series. David will serve as executive producer under the Ideate Media production banner (Dirk Gently’s Holistic Detective Agency), as will Carey, Cavan Ash, Intrepid Pictures’ Trevor Macy and IDW Entertainment’s CEO Ted Adams and President David Ozer. 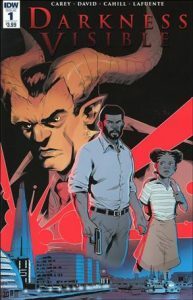 The six-issue miniseries released in February imagines a world where demons and humans live side by side. It is both a supernatural thriller and a commentary on race, immigration, terrorism and politics. The story starts in World War II, when demons aid the Allies in destroying the Axis. In return, demons are allowed to live among humans. Eighty years later, the truce is a tentative one at best. Terrorism is rampant between humans and demons, and Detective Daniel Aston is one of the few trying to keep the peace. When Daniel’s daughter is put in danger and a demon sets up residence in his soul, though, his patience is put to the test.